Has numerous business interests, both racing & non-racing related, including car dealerships, gas stations & books, Involved with his son Michaels IRL team where his grandson Marco is one of the drivers (2006-2009). Elected to American driver of the century 1999. Tested Michael IRL car at a INDY500 test 2003 where he crashed. Started INDY500 29 times won it ones, in the spere car. 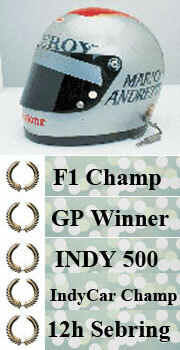 At 19 Andretti falsified a drivers license so he could pass for 21 and enter his first amateur motor race. In January 2011 Mario joined the Indianapolis 500 Centennial Tour to visit with American military personnel in Europe, U.S. bases in Southwest Asia and on an active duty U.S. carrier at sea. 2011 he was named one of the “25 Coolest Athletes of All Time” by GQ Magazine.